Bush Says Liberty Creates Innovation Which Creates Wealth, 11/18/03. A. Summary of Bush's Speech. B. Three Significant Elements of Bush Theory. C. Precedent for Bush's Theory. D. Application of Bush Theory to the Islamic World. A. Summary of Bush's Speech. In Bush's economic theory, freedom and liberty lead to creativity, innovation and technological progress, which in turn, lead to social progress, wealth and prosperity. Said Bush, "the prosperity, and social vitality and technological progress of a people are directly determined by extent of their liberty. Freedom honors and unleashes human creativity -- and creativity determines the strength and wealth of nations. Liberty is both the plan of Heaven for humanity, and the best hope for progress here on Earth." B. Three Significant Elements of Bush's Theory. World leaders have given countless speeches advocating democracy and freedom. Some even give speeches arguing that free enterprise and property rights leads to prosperity. Three things are significant about Bush's speech. All of these have implications for public policy. First, he assigns a central role to creativity and innovation, while expressly rejecting several other theories regarding the source of national wealth. He rejected communism, central planning, militarism, and theocratic terror, as one would expect of a Republican President. However, he also left out of his speech many factors that other American leaders and economists emphasize, such as natural resources, government spending, monetary policy, and the mysterious role of capital. Also, Bush referenced "education" just once, and gave it no emphasis or elaboration. C. Precedent for Bush's Theory. Bush is not original in arguing that individuals, democracy, freedom, and human aspiration are related to innovation and prosperity. Nor is this a partisan viewpoint. Alan Greenspan, Chairman of the Federal Reserve Board, has made a similar argument. He gave a speech on April 2, 1998, in which he argued that the melding of democracy and human rights with property rights is essential for a well functioning market economy, which in turn, provides for the greatest prosperity. Greenspan (at right) stated that "Most other rights that we Americans and others cherish -- protection against extra-legal violence or intimidation by the state, confiscation of property without due process, as well as freedom of speech and of the press, and an absence of discrimination -- are all essential to a fully effective, functioning market system." Moreover, Greenspan said, freedom allows innovation which is essential to a market economy. He said that "Centrally planned economies tend to be frozen in time. They cannot readily accommodate innovation, new ideas, new products, and altered specifications. In sharp contrast, market economies are driven by what Professor Joseph Schumpeter, a number of decades ago, called ``creative destruction.�� By this he meant newer ways of doing things, newer products, and novel engineering and architectural insights that induce the continuous obsolescence and retirement of factories and equipment and a reshuffling of workers to new and different activities. Market economies in that sense are continuously renewing themselves. Innovation, risk-taking, and competition are the driving forces that propel standards of living progressively higher." Similarly, Todd Dickinson, who headed the U.S. Patent and Trademark Office (USPTO) in the Clinton administration, gave a speech on October 23, 2000, in which he united the concepts of democracy, equality and innovation. He said that the goal of the USPTO is "to preserve one of the most fundamental rights of this nation -- to succeed." Dickinson (at left) continued that "I know that this is never a guarantee, in any country. But, I would like to think, in the United States, that we have special respect for the pioneer spirit, for the innovator, for the worker who takes that innovation, and makes something of it." "We are a democracy. We rejoice in the level playing field. We celebrate in gifts of equality. And as we work to protect, and encourage, and grow the intellectual property community, the USPTO is attempting to honor these ideals, and pay homage to a promise that has come to symbolize the United States, and that is the American Dream." "Now, this concept, I don't think is tired refrain -- it is a reality, for our citizens, or even those who hope to become citizens. And it is my belief, that in this new era, the intellectual property system has become one of the key vehicles for their hopes, a representation of the American Dream, whatever it might mean to an individual." Some historians agree with this statement, but advance the line of argument even further. They explain the reasons that the founding fathers wanted to move from an "agrarian colony to an advanced and prosperous country". It was not just because prosperity is a desired end. There were other goals, including promoting liberty, ending slavery, decreasing sectarian and regional conflict, and uniting and strengthening the new nation. See, for example, "Slavery, Section and Progress in the Arts" by Paul Rahe, of the University of Tulsa. The first two of these items are pertinent to President Bush's argument. The first argument is that the founding fathers wanted a nation with liberty, but were aware that there was not much of an historical record of agrarian nations with extensive liberty. They were influenced, the argument goes, by the British writer, David Hume, who had recently written that commerce and manufacturing tend to put property and power in the hands of a commercial group, who in turn tend to be supporters of liberty. See, Hume, "Of Refinement in the Arts". The argument continues that the founding fathers believed that intellectual property would promote innovation which would promote commerce which would build up the commercial crowd, who in turn would support and defend liberty. Bush puts a lot of the same elements into the argument, but puts them in a different order. So perhaps, President Bush and these historians are in consensus on the correlation of liberty, innovation and prosperity. But, they differ on the order of causation. But then, Bush also inserts another line into his speech: "Historians will note that in many nations, the advance of markets and free enterprise helped to create a middle class that was confident enough to demand their own rights." This puts him more in sync with Hume. The second argument is that the proponents of the intellectual property clause sought an end to slavery, but recognized that legislators in the agrarian southern states, who were elected by slave owners, would not support abolition. These people had just based a revolution based on the notion that all men are created equal and entitled to liberty. They sought to carry through on these principles, by abolishing slavery. They reasoned that protecting intellectual property would promote innovation, which would promote commerce, which would build up a large commercial sector with no ties to slavery, which would elect legislators who would abolish slavery. However, as history played out, intellectual property protection did not lead to the end of slavery. Sectarian rivalries increased. And a bloody civil war resulted, which in turn, lead to the end of slavery. What then, does this portend for Iraq, if anything? 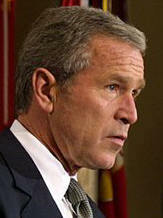 D. Application of Bush Theory to the Islamic World. Bush argued generally that freedom and liberty lead to creativity, innovation and technological progress, which in turn, lead to social progress, wealth and prosperity. However, he was talking specifically about Iraq. He stated that "Some skeptics of democracy assert that the traditions of Islam are inhospitable to the representative government. This ``cultural condescension,�� as Ronald Reagan termed it, has a long history." He argued that "It should be clear to all that Islam -- the faith of one-fifth of humanity -- is consistent with democratic rule. Democratic progress is found in many predominantly Muslim countries -- in Turkey and Indonesia, and Senegal and Albania, Niger and Sierra Leone. Muslim men and women are good citizens of India and South Africa, of the nations of Western Europe, and of the United States of America." U.S. Trade Representative (USTR) Robert Zoellick (at left) has made a similar argument. He gave a speech [PDF] on June 23, 2003 at the World Economic Forum in Amman, Jordan. He noted the economic success of Arab Americans living in the U.S., as did Bush, and concluded that "A rebirth of commerce and intellectual discovery awaits only an awakening of economic liberty throughout their homelands." See also, story titled "U.S. Focuses on Trade and Tech in Islamic Nations" in TLJ Daily E-Mail Alert No. 687, June 25, 2003. In contrast, Charles Murray, author of Human Accomplishment: the Pursuit of Excellence in the Arts and Sciences, 800 B.C. to 1950, released last month, disputes this. He wrote in his book that "For a few centuries at the turn of the first millennium, Islam presided over a burst of exuberant scientific and philosophical inquiry. It began with the translation of the treasure of Greek and Roman manuscripts that had lain forgotten for centuries. It then went beyond translation, producing a large body of original work in mathematics, chemistry, astronomy, optics, and philosophy, among other fields. Then this burst of activity died away. Summarizing and simplifying the argument that follows: Islam provided a sense of purpose and vitality that helped power the achievements of its golden age, but Islam could not accommodate itself to the degree of autonomy required to sustain it." Quoting from another historian, he writes that "the root cause of its decline is to be found in the Faith, and in the ability of it orthodox upholders to stifle once-flowering science." Murray discussed this point in more detail at a lecture on October 28 at the Cato Institute. He said that in early Islam "you have a vital culture, full of energy, full of self confidence, approaching all of these new treasures undefensively, and with enthusiasm. But even as they were doing that, there was a sense among Islamic scholars and scientists that what they were doing was on the edge of what was permissible. And the reason for this goes to a variety of aspects of the Islamic faith. But, one of the main ones has to do with the conception of God as creating the universe continuously, sustaining the universe continuously, I should say. So, that, the God of Islam is not a God who set in motion universal laws and then let the clock tick, but rather a God that is sustaining by his own act of will from second to second. To say, of such a God, we are going to find out the laws under which he is going to operate in the next second, is essentially blasphemy. For about a hundred and fifty, two hundred years, the mullahs weren't paying attention. The imams weren't paying attention. That is about as simply as I can put it. That even at that time people kind of knew that this might be blasphemous. But, then, after about one hundred and fifty years, for various reasons, ... the theology was raised as a barrier to this kind of work. And all of the scholars that I have looked at this, including Islamic scholars, say, it ultimately goes back to the faith. The faith is not consistent with the kinds of inquiry that flourished, and they stopped. I have no idea how much trouble I am going to get in for that." Murray's book is reviewed in the next article in this series.